Solo Build It! Tools blend into a complex system that allows you to turn an idea into income. Without prior knowledge of either technology or business. 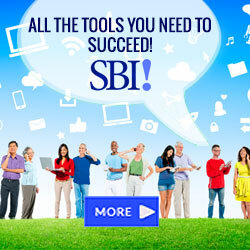 A Solo Build It tools review affords a glimpse of how SBI! does it. If you do possess knowledge of either or both technology or business . . . The integrated Solo Build It! business building platform consists of more than eighty modules. Don’t let that faze you. You only use one tool at a time - as we are reminded here - at the indicated right time. Garner a touch of familiarity with one SBI! Tool and it won’t be long before you are eagerly awaiting the opportunity to get your head around the next one. In this review we look at a sample of the Tools that make SBI! tick and hum. Culminating, in part four, with a Masterpiece that should be emulated in every sphere of Human activity. The best place to start a Solo Build It tools review is at the beginning. That means Site Concept Finder. This nifty tool is part of Brainstorm it! - an SBI!! Smart Module. At the click of a button - via Brainstorm it! - Site Concept Finder brings to your attention hundreds of keywords related to your interests, skills and expertise. Remain open minded, and aware of the Long Tail while engaged here. You may experience a eureka moment, straight out of left field. That simply means you notice a concept that is literally ‘right on the money’, that you otherwise would not be conscious of. Even if you have already decided beforehand - like me - on your site concept, this tool can provide much useful – and surprising - info on that theme. Allowing you to maximize your concept’s Monetization potential. Does your favorite idea contain the potential to provide an income? How much time do you need to fully exploit that potential? How do I choose a standout Domain Name? Niche Choose It! is the tool you use to find an intelligent answer to these and other important questions. This tool enables you to compare three Niche Themes, at one time, for parameters that are both important to you, and make good business sense. It is well worth mentioning at this point that Artificial Intelligence is playing an ever more prominent role in the articulation of the World Wide Web. The tools we use to effect this articulation are being endowed with this newcomer. This is Good news for Good Humans, and bad news for Humans with no scruples. The Internet overlays a foundation of Keywords and Links. A foundation that, when not abused or manipulated deleteriously, works amazingly well. How satisfying is it when you punch in a keyword and find what you are looking for, on the first Search Engine Results Page? Search engines in general, and Google in particular, are making rapid advances in delivering what searchers are asking for. Artificial Intelligence is being employed to construct Smart Algorithms that can interpret what a page is about, based on not merely keywords but also actual content. This means, in the eyes of the search engines, a well written keyword focused page stands head and shoulders above the mediocre masses, particularly above those pages that also ignore Search Engine Optimization Guidelines. Sad for the delinquents who believe in shortcuts, but a sound solution to a vexing problem. Gosh! that is just what we Good Humans want . . . Who isn’t fed up with incompetent trickery and deceit? Solo Build It Tools work hand in glove with these intelligent parameters. In my view, this is great minds thinking alike. Implementing Internet Best Practice has always been SiteSell’s approach to e-business, and now that the search engines are catching up with the devious characters who detract from surfers experiences, it can only be good news for SBI!ers. Current, and yet to be. Every SBI! Tool is best practice focused, and works in Harmony with the search engines. Exemplified by the SBI! Brainstorm It! Module. A few paragraphs is no where near sufficient space to adequately describe this remarkable module, that now it it's smart guise, is destined to dramatically augment it's already well deserved reputation. Nevertheless we can gain an insight or two of just how indispensable Brainstorm It! is to anyone who is serious about building a successful e-business. The Web is all about Keywords, the major way to be found on the Net. Finding appropriate keywords is time consuming and can be brain-racking. Particularly after the first five. Multiply that figure by one thousand and you have the capacity of Brainstorm it! Brainstorm it! has the capability to search for, and find, hundreds of related keywords. In a bare few minutes. Up to five thousand keywords - analyzed categorized and grouped in whatever order you decide appropriate . . .
From the beginning - where you construct your site content "Blueprint" all the way up to advanced and seasoned content provider, Brainstorm It! will surprise you with the pearls about words it delivers. The following list is a mere appetizer so to speak. Brainstorm it! contributes in a big way to no guessing by delivering reliable facts. Worth it's weight in diamonds, every Webmaster deserves to have this exclusive to SBI! gem of a tool. Since it’s inception, Brainstorm It! - in conjunction with the integrated program that makes Solo Build It! unique, has enabled SBI!ers to write informative pages that build Trust and Goodwill. The type of professionally optimized pages the search engines want to serve to searchers. That is . . . Pages visitors want to read. Now that Brainstorm It! is "intelligent" it opens up a whole new world of data mining. As you build your business BI! collects and collates data about the keywords you have used. You can analyze this info yourself, or consider suggestions offered by Brainstorm It! While this aspect won't be of immediate use to a beginner, as you advance and write more pages, - perhaps using suggestions from BI! for keywords that may have slipped your mind - you can dwell on the accessible gold mine of magnetizable info you are creating for future use. With one proviso in mind. Let’s not forget, it is we Humans who apply intelligence, artificial or real!! The answer to this cautionary suggestion, is of course, to consistently employ our BAM. Once you use Brainstorm It! to achieve your above average results, you may feel a touch guilty about how little you are paying for the complete Solo Build It! platform. Ken Evoy and SiteSell are well aware of the value they are providing. It is part of their policy of over-delivering to their clients. Indeed, it is a policy they encourage their thousands of appreciative members to follow. Again helping to make the Web a better place. Please stay seated, we have barely scratched the surface of the immense value inherent in this admirable e-business building platform. Solo Build It Tools Rock!